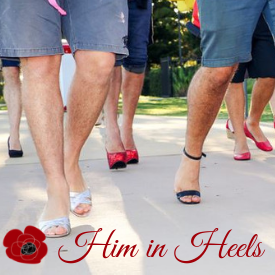 Our fabulously fun event HIM IN HEELS is back for 2019! Local businessmen and identities are invited to join us for a morning walk and talk about Family and Domestic Violence issues, equality and subjects affecting local women. Grab your stilettos, and a mate, and register today. All funds go the local Womens Refuge. Thanks to the Regional and Agri Business Unit of Commonwealth Bank Port Macquarie for sponsoring this event for the second year. Registrations Now Open. Supporters welcome! The theme for this year's event is #BalanceforBetter with participants agreeing to wear 'heels' and complete the walk on March 1 2019. An entry fee of $200 applies, which is a direct donation the fundraiser for the Liberty Domestic and Family Violence Specialist Service.